Indian culture is very exotic and elegant, which all reflected in the Indian home décor design. That is why if you want to have an exotic and elegant house décor, then you might want to try having this style inside your house. Furthermore their style is filled with beautiful fabric and furniture which rich in texture since they are often made by hand, and those are the things that make Indian style very detailed. With rich detail surely it will also make your interior decoration design become more luxurious, here are some items that you could use inside your house. As we said before India has beautiful selection of Indian home décor fabric which you should try to filled your house with them. Furthermore the fabric could really be used for a lot of things so you would not run out of decoration for every room. If you want something authentic to decorate your house, then you could easily purchase a sari fabric and frame it, then you can use it to decorate any room that you want. For other detail there are pillow case, bedding set, window treatment, shower curtain, carpet, and many other fabrics which will make your room rich with details. The Indian house design is all about color since they are represented with special color combination which makes the design unique and charming compared to other home décor. For Indian home décor inspiration you need to use color in natural tone, mostly it would be earth tone like terracotta and such but if you want it to be more colorful then you can also use natural flower color which you could find outdoor and bring it indoor to decorate your house. Still natural earth tone will work best for the background and surrounding but for the accent color you could use brighter floral tone. Another signature of Indian home décor that you could use is the handcrafted furniture with beautiful craft on the side and on the surface. Most of the furniture which handcrafted is made using woods but there is also furniture with bronze surface which also crafted and attached to the wood furniture. Because of the material used to create the furniture, most of them have natural brown tone. That is why if you want to add more colors to them, then you must use a few throw pillows with them to make it colorful. But do not use it too much since it might overpower the craft which should be the main interest of the furniture. This last Indian home décor might be a thing that you should always have inside your house especially when you applying Indian theme. 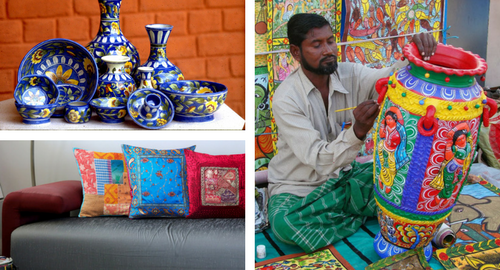 The pottery will give your interior design an esthetic side of Indian culture since pottery is one of the arts from India that people use to express their feeling. Not only that, but actually there are pottery that you could actually use such as Indian tea set pottery, Indian dining set pottery, vase, and many others. Moreover the pottery also presented with colorful appearance which could add more tone to your interior design. When you first see Indian interior style, you will see that most of it is using earth tone so you will feel that it would be boring. But actually you could add more color by using the fabric and the pottery items. That way it will create balance to the background and furniture which mostly on earth tone. But then again that earth tone is actually understandable since India located on tropical climate which makes them love the nature more. For you who live in temperate climate then it will give your house more warm and comfortable. Still combination of color that you use should not overpower the warm tone that this theme has since the warm tone is the main thing that makes this theme interested in the first place. Of course with the addition of the colors you use inside the design as Indian home décor items it will complete the design.